Our range of products include automatic sticker labeling machine, automatic horizontal top sticker labeling machine, semi sticker labeling machine and manual sticker labeling machine. With the comprehensive industry knowledge of allied domain, we are engaged in presenting a superior quality range of Automatic Sticker Labeling Machine. 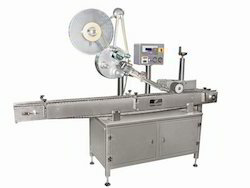 The offered machine is suitable for applying single side labels on flat / round shape containers with output Up to 120 labels per minute depending on products size and label size. 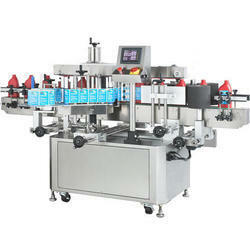 Automatic product alignment system synchronized with top holding mechanism. Apart from this, clients can get the machine from us at industry leading rates. acked by our years of industry experience, we are betrothed in presenting an excellent quality of Automatic Horizontal Top Sticker Labeling Machine. This efficient machine is manufactured using quality materials and advanced technology. Our professionals manufacture all kinds of machine according to the trending demands and clients’ needs. In addition, the offered machine is built and developed adhering to industry standards. Furthermore, quality control team opts for strict quality inspection to assure flawless performance of the machine during operation. Semi Sticker Labelling Machine offered comes designed and developed using latest technology support so as to provide for high functional performance. Our rich industry experience in this field enabled us to provide a wide range of Manual Sticker Labeling Machine to our reputed clients at reasonable prices.